AsiaSat investigates C-band’s exceptionally high rain fade attenuation reported by uplink stations during monsoon seasons in South East Asia, and then proposes techniques for uplink station operators to mitigate against these issues, to improve their service level availability. 1) Replace new feed Teflon coated diaphragm regularly (yearly) to prevent rain water staying on the feed aperture. This is because the waterproof capability of old diaphragm can be degraded after long time operation. 2) Increase the rain blower wind speed as it may help reduce the accumulation of water in front of the feed aperture. 3) Increase the uplink power by 3dB in advance, an hour before heavy rain begins to compensate resulting decreased power. In satellite transmission modelling, the path loss is the reduction in the power density of an electromagnetic (EM) wave as it propagates through space. The path loss includes free space loss which depends on frequency and distance, and propagation loss as a result of refraction, diffraction, reflection and absorption when the EM wave propagates through the medium between transmitter and receiver. International Telecommunication Union (ITU) provides a model to estimate the propagation loss between earth and space, and is generally used by network engineers to determine the rain margins in the corresponding link budget analysis for different geographical sites. However, AsiaSat has observed and received reports of higher than expected C-band uplink propagation loss during heavy rain (typically 50mm/h rainfall rate) from some uplink stations. By tracking the performance differences between the satellite telemetry and the rain attenuation prediction data, insight can be gathered for more detailed investigations. For example, it is observed that the uplink propagation loss is about 8 to 11dB through the telemetry for an uplink in Singapore during heavy rain, however the ITU rain model prediction can account for only part of the observed losses based on the reported rainfall rate from Meteorological Service Singapore. Investigation shows the additional and unexpected loss is a combination of the antenna loss due to the water film formed on the surface of the feed aperture, and the water pool accumulated on the main reflector, resulting in wet antenna attenuation (WAA). Wet antenna attenuation is an additional contributor to the overall signal fading during rain events along the communication link path. We performed extensive tests to measure the losses under different water film thickness on the feed aperture. In addition, antenna gain degradation due to the water accumulated on the main reflector surface has been measured. Based on these measurement results, we are able to better understand the effect of the wet antenna attenuation from the propagation loss, and estimate the required transmitting power capability for uplink power control during heavy rain. The coastal region of China and South East Asia are located within the ITU wet zone. Heavy rain is expected especially in monsoon seasons. Based on the ITU rain model, the predicted rain loss depends on rainfall rate, antenna elevation, frequency and rain path length. The rain loss is about 4dB at 6GHz during severe rain when rainfall rate is greater than 120mm/h. The estimated rain loss of Singapore at 6GHz versus rainfall rate is shown in Figure 1. For some advanced satellites, as in AsiaSat’s fleet, uplink power data can be retrieved from satellite telemetry data which measures the input power to the high power amplifier (which is TWTA in AsiaSat's fleet). By trending the telemetry, we can determine the delta of incoming power between clear sky and adverse weather condition from the uplink station. Based on the trending of the collected data, the uplink rain attenuation was about 8 to 11dB in Singapore and Hong Kong during heavy rain condition at C-band. By cross correlating it with the ITU data, there is an unexpected additional loss of approximate 6dB. To investigate the output power degradation on feed aperture with different water film thickness, a broadwall coupler was used to conduct the forward and reflected power measurements. The output signal degradation versus different water film thickness was characterized, and the test setup is shown in Figure 2. The test results show that the output signal degradation at 6GHz will worsen when the water film thickness increases. The output signal degradation will be about 2dB when the water film thickness on the feed aperture is about 0.1mm, but when the thickness reaches 0.2mm, the output signal degradation will increase significantly to about 7dB. The output signal degradation can exceed 11dB if the water film thickness is more than 0.3mm. The signal degradation looks higher than the predicted number mentioned in the literature  because the assumptions of materials like dielectric constant and conductivity of feed horn radome and permittivity of water used for prediction are different from the actual measurement, particularly when an accurate measurement of the complex permittivity of water is not a trivial effort. Degradation is caused by part of the transmitting power being reflected back to the transmitter, thus reducing the total output power. The water film on feed will distort the electric field distribution of the feed, and as a result creating a high perturbation on the feed standing wave ratio (SWR) which means more power is reflected. The reflected power will increase as the water film thickness on the feed aperture increases. The relationship between the output signal power degradation and the water film thickness from the measurement data is shown in Figure 3. A modulated carrier was transmitted to our advanced satellite, AsiaSat 7, by a 5m antenna dish under nominal configuration on the antenna feed and the transponder drive is linear. The carrier was received by a 9m antenna and an IRD receiver. The receiving carrier C/N can be obtained by IRD receiver and the spectrum analyzer. By observing the changes of receiving carrier C/N with different wetting conditions on the aperture, a better understanding of the wet antenna attenuation was achieved. The weather condition under test was clear sky. A wet tissue was placed on the feed aperture, the receiving C/N was reduced to 16.9dB, IRD margin 2.9dB and HPA reflected power 3W. By comparing the dry and wet issue case, 2.3dB signal loss from C/N and 3W HPA reflected power were observed. The test setup on feed aperture is shown in Figure 4a. The test setup on feed aperture is shown in Figure 4b. Results show about 7.1dB signal degradation from the spectrum. The smaller degradation than the wet towel case is because the bag of water is smaller than the feed aperture thus the feed aperture is not entirely covered by the water. The test setup on feed aperture is shown in Figure 4c. Results show that there is about 2dB output signal degradation if the water film is as thin as a wet tissue and fully covers the feed aperture. If the water film is like a wet towel and fully covers the feed aperture, it will cause significant degradation on output signal. If the water film does not fully cover the feed aperture, the degradation is less severe so the rain blower does help to mitigate the degradation because it can prevent the water film from staying on the surface of the aperture. The antenna gain degrades if water accumulates on the main reflector. To investigate the corresponding loss, a test has been conducted with results in line with our prediction. The antenna elevation look angle toward AsiaSat 7 is about 60 degree in Hong Kong so the rain water may accumulate on the main reflector. 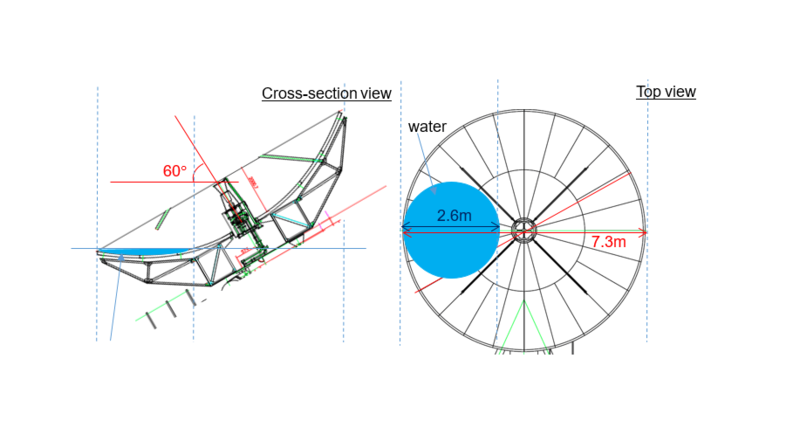 For a 7.3m antenna, the maximum area of accumulated water on the main reflector surface is about 2.6m in diameter, which is about 13% of the surface area of the antenna. The water pool will affect the total energy toward the target satellite due to scattering, and as a result degrading the antenna efficiency. The estimated worst case gain degradation is about 0.6dB. The test case has the same test setup as outlined in (2). A plastic sheet was placed on the main reflector and the receiving C/N was about 19dB, IRD margin 5.2dB and HPA reflected power 1W. Water was sprayed on the sub-reflector, with water accumulating on the plastic sheet to form a pool on the 5m antenna. The observed receiving C/N is about 18.58dB, IRD margin 4.6dB and HPA reflected power 2W. It shows about 0.6dB degradation by comparing the delta of IRD C/N margin which is in line with our prediction. The test setup on feed aperture is shown in Figure 5. Replace new feed Teflon coated diaphragm regularly (yearly) to prevent rain water staying on the feed aperture. This is because the waterproof capability of old diaphragm can be degraded after long time operation. Increase the rain blower wind speed as it may help reduce the accumulation of water in front of the feed aperture. Increase the uplink power by 3dB in advance, an hour before heavy rain begins to compensate resulting decreased power.